Jamii Tata, president/CEO of Oakland Avenue Artists Coalition, and supporters show their vision for the proposed Moore Community Park. The Kresge Foundation today announced grants totaling $2 million to 17 nonprofits for projects to revitalize neighborhoods across Detroit. This final round of grants in the Kresge Innovative Projects: Detroit pilot initiative brings its grant total to $5 million since being announced three years ago. The new grants, reflecting the foundation’s deepening commitment to city neighborhoods, will fund, for example, the creation of a new community hub on Grand River in the Grandmont Rosedale neighborhood and conversion of a blighted five-block stretch of the Morningside neighborhood into an agricultural greenway. The grants support renovation of an abandoned duplex into an art center in central Detroit and a Southwest Detroit program to promote the conversion of vacant second floors of commercial buildings into needed residential spaces. In addition to the creation of community gathering spots, green spaces and conversion of abandoned properties to new uses, efforts under the Kresge Innovative Projects: Detroit umbrella will make neighborhood streets and sidewalks more walkable, bring artists and community organizations together for collaborations in parks, and engage youth in neighborhood revitalization. Kresge’s support for these shovel-ready projects ranges from $75,000 to $150,000 in the initiative announced in 2014 as a three-year, $5 million pilot effort to promote visible, positive change across the map of Detroit. The latest grants were chosen from nearly 70 applications, making for a highly competitive process. “Simply put, Kresge Innovative Projects: Detroit is one factor leading us to double down on the neighborhoods of Detroit,” Jackson added. Auntie Na's treasurer Aaron Appel, left, and Auntie Na (Sonia Renia Brown) at the house where students gather daily for activities in the Livernois-Amherst neighborhood. The group plans to convert a nearby abandoned house into a free medical clinic, a community food hub and a small residential space. Donna Givens, center, president and CEO of the Eastside Community Network, with members of her staff and students from Alexander Hamilton School, in the vacant lot they plan to turn into a rain garden. Southwest Detroit Business Association, Southwest Detroit: Renovate the second floors of four commercial buildings on West Vernor Avenue to create 10 housing units. More than 80 commercial buildings in the area have vacant second floors; this pilot project aims to demonstrate the feasibility of such conversions for a safer, more active business corridor that will keep more young adults in the neighborhood. (District 6). Christina Heximar, associate director of the Detroit Collaborative Design Center, left, and other supporters seeking to turn abandoned alleys like this into an asset that benefits the Fitzgerald neighborhood. “Cumulatively, we see these grants adding to the momentum of change in city neighborhoods,” says Jackson. “Change in neighborhoods is taking hold and spreading thanks to groups like those we are recognizing with grants today. “Our grantees are utilizing what’s been abandoned and left vacant; they are reclaiming city blocks that otherwise would fall prey to dumpers and scrappers; they are creating green infrastructure and new community spaces; and they are developing human capital and community, particularly among young people,” says Jackson. Although this marks the third and final round of Kresge Innovative Projects: Detroit, Jackson says the Detroit Program will use what has been learned through this pilot initiative to guide the development of future efforts to support the work of Detroit-based nonprofits in driving neighborhood-level transformation. Including 17 announced today, there have been 37 Kresge Innovative Projects: Detroit implement grants; earlier rounds of the initiative included 19 planning grants. Among the projects completed from the first two rounds of the initiative are the creation of a half-acre market garden and education center at the Penrose Village housing development in Chaldean Town, improvements to the Judge Stein Playfield in Cody-Rouge, the creation of pocket parks with fitness equipment in the Middle Woodward Corridor, renovation of a new home for the Downtown Detroit Boxing Gym Youth Program on the lower eastside and transformation of a vacant lot and commercial building into community gathering spaces in Southwest Detroit. 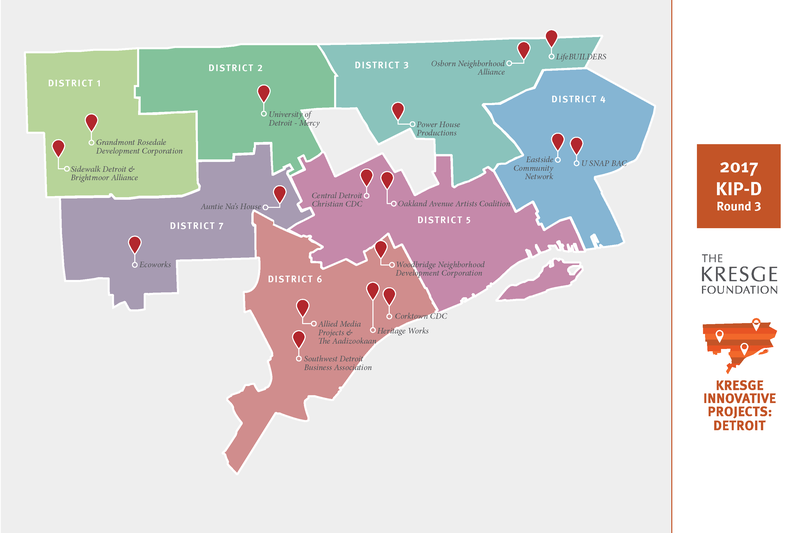 In addition to implementation grants, Kresge Innovative Projects: Detroit has funded 19 planning grants of up to $25,000 to help organizations map out projects, several which produced successful implementation applications. The final grant-round announced today consists entirely of implementation projects, bringing total implementation grants to 37 over the life of the initiative.